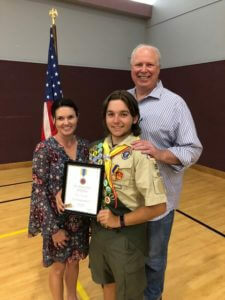 The Alamo Area Council is proud to announce the awarding of the Medal of Merit to Oliver Chandler for his actions using his Scouting skills to save lives. While on a Whitewater Raft excursion at the New River Gorge in West Virginia, Star Scout Oliver Chandler, age 16, and his crew ended up in water flowing faster than anticipated. Two members were ejected from the raft causing their guide to use the rescue line to haul them back to the raft. Shortly after bringing the second person back aboard, the raft capsized forcing everyone into the incredibly fast moving water. At this point, Oliver saw that Caleb Wilder, age 12, could not swim back to the boat due to the swift current. Although Caleb was wearing a life vest and helmet, there were no other rafts ahead that could have pulled him to safety. Oliver, with disregard for his own safety, launched himself toward Caleb and was able to grab his collar and bring him back to the now upright raft. He then pulled himself into the raft while securing Caleb by his wrists, then pulled Caleb aboard and assisted bringing others back into the raft as well. By demonstrating great courage and compassion for others, a terrible tragedy was averted. Oliver Chandler is a member of Troop 90, sponsored by Abiding Presence Lutheran Church in San Antonio, Texas.